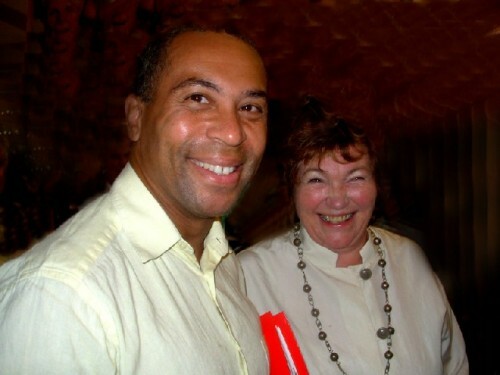 Governor Deval Patrick, with Tina Packer, artistic director of Shakespeare & Company attended opening night of Othello. Giuliano photo. 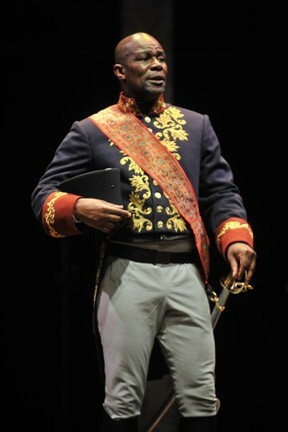 John Douglas Thompson as a magnificent Othello. Michael Hammond was less effective as Iago. Kevin Sprague photos for S&C. Othello denounces Desdemona (Marritt Janson). Cassio, LeRoy McClain, with the strumpet Bianca, Elizabeth Aspenlieder. The rather basic set for Othello. Directed by Tony Simotes; Sets, Yoshi Tanokura; Costumes, Gail Brassard; Lighting, Les Dickert; Movement Director, Susan Dibble; Composer/ Sound Director, Scott Killian; Voice and Text Coach, Malcolm Ingram; Production Stage Manager, Hope Rose Kelly. 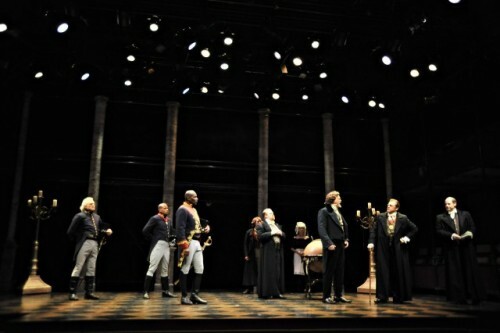 Cast: John Douglas Thompson (Othello), Michael Hammond (Iago), Merritt Janson (Desdemona), Leroy McClain (Cassio), Ryan Winkles (Roderigo), Kristin Wold (Emilia), Elizabeth Aspenlieder (Bianca), Johnathan Croy (Lodovico), Tom Ridge (Duke of Venice), Michael F. Toomey (Montano), Walton Wilson (Brabantio). Coming to "Othello" at Shakespeare & Company last night there was a lot of personal history. Starting in the 1960s when a friend organized a group of Brandeis students to serve as extras when the Metropolitan Opera made its then annual visit to Boston. As luck would have it one year we were on stage for "Tosca" and the next season it was "Otello." We arrived at the theatre in the morning and were made up and put into costumes. Until the evening performance we hung out back stage and waited for our cue to march on stage. It was fascinating to see various singers strolling about and rehearsing their parts. But the climactic moment occurred when Otello, performed by the legendary James McCracken, collapsed to the ground in a fit of rage, just inches from my astonished feet. Not surprisingly "Otello" became one of my favorite operas. For many years I shared it with students in humanities classes. Few if any of them had ever experienced opera and the 1986 film by Franco Zeffirelli, starring Placido Domingo as Otello, with a sublime Katia Ricciarelli as Desdemona, is truly magnificent. Even after repeated viewing her " Willow Song and Ave Maria," moments before being strangled and smothered by Otello, never failed to leave me reduced to tears. The Zeffirelli, even though an opera, remains for me the definitive film of the great Shakespeare work. Far superior to the famous versions by Sir Laurence Olivier (1965), Orson Welles (1952) or Laurence Fishburne and Kenneth Branagh (1995) to mention but a few of the many film/ video productions. A particularly fascinating aspect of the Zeffirelli treatment was that he emphasized the Islamic aspect of the Moor which is often vaguely treated. Othello was captured as a child and brought up as a slave in Venice slowly evolving to the rank of general. It is assumed that he is Christian. Indeed he fights the Turks at Cyprus and is an enemy of Islam. But, in his darkest hour, seething with very unchristian jealousy and rage (two of the seven deadly sins) Zeffirelli has him renounce Christianity. We see Placido Domingo descend into a dungeon like cellar dramatically lit with candles. He is wearing a North African caftan. With austere solemnity he removed a chain and cross from his neck and cast it into the flames. Having renounced all aspects of Christianity it is as a Moor that he is then prepared to murder his innocent wife. There were perhaps unrealistic expectations approaching the Shakespeare & Company production with its limited resources. The program lists Yoshi Tanokura as Set Designer but is it unfair to ask, what set? To say that it was minimal risks understatement. There were several ersatz pilasters which we were invited to surmise as the faÃ§ade of a palace. And some construction staging served as its second story and balcony. There were some props but mostly we were left to our imagination. This utter lack of production value enforced the notion that we were assembled for that magnificent text. Truly, "Othello" is one of the greatest of all dramas. Period costumes (more 19th century than Elizabethan) were adequately designed by Gail Brassard. There were flashes of suitably ominous original music by Scott Killian. The real focus was on those magnificent characters. Over the centuries the greatest actors have aspired to perform the role of Othello. Until fairly recently the role was given to famous Caucasian actors in blackface. This was always problematic and despite its many awards the Olivier Othello was not his greatest triumph. 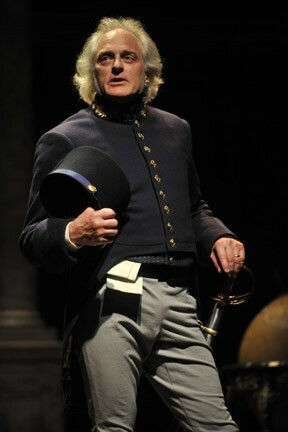 It is reported that he suffered from terrible stage fright all through the run of the play in London. While Othello is one of the greatest roles many note that Iago is even more challenging for actors. It is Iago, with his blinding hate and jealousy, who really drives the play. Othello is a bull and a blind fool led around by the nose. It appears that Othello lacks the dimension, intelligence and wit to see through the blatant manipulations of Iago. Othello is such a dolt (is there an element of racism) that he never really captures our sympathy let alone empathy. The response seems more like, look you idiot, and see what you've done to your wife. His melt down after the murder too often evokes more bathos than pathos. Even in his final undoing Iago is ultimately more fascinating as he really got what he wanted and is willing to pay the price for his deeds. In the dungeons of Venice, which we explored recently, that would have been quite horrific. 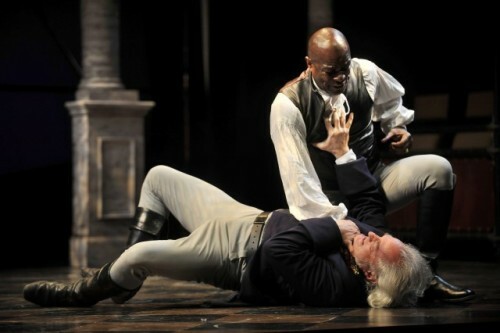 In this production John Douglas Thompson is a truly magnificent Othello. He manipulates the difficult text effortlessly. As a master of the language and cadence Thompson was able to convey the slow arc of the Moor's destruction with rich nuance. We see him initially as the smitten lover of Desdemona, a devoted husband, and hero of Venice. As Aristotle conveyed in the "Poetics" he undergoes a reversal due to the tragic flaws of a hero, pride, and hubris. Add to this the element of jealousy. In the paradigm of tragedy we see the exalted humbled and brought to ruin. While Thompson's superb Othello sustains this production he is undermined by a miscast and poorly played Iago (Michael Hammond). Everything about Iago seemed wrong starting with being too old for the part and out of shape for a swaggering, passed over officer. Iago also despises Cassio who got the commission to which he aspired. In numerous asides Hammond told us why he hated and plotted against Othello but I never felt convinced. He seemed unable to truly inhabit the character. Too often he appeared to struggle with the text rather than delivering it with force and conviction. This weak and mediocre casting of Iago did a lot to sabotage the production. The other characters, however, were often superb. The Desdemona of Merrit Janson was gentle and compelling in her innocent love. She conveyed the part with great conviction. But the scene before her death, when Emilia (Kristin Wold) prepares her for bed, is flawed. She sings the Willow song gamely but doesn't have a very compelling voice. No, her death song did not bring a lump to my throat. The casting of another black actor, LeRoy McLain as Cassio, was truly inspired. He is a gifted Shakespearian actor. The character is also key to the drama and plot of Iago to undo Othello. McLain was absolutely perfect in all that was asked of him. Overall, this production was well directed by Tony Simotes. One senses that he got the most from the limited resources at his command. It is anticipated that many of these production issues will be addressed once that the new Elayne P. Bernstein Theatre opens in August. Until then, many of the issues which we note in the current production may be regarded as growing pains. But they still hurt.